By contrast to the many accomplishments of the Han dynasty the period from 220 to 589 was one of disunity and turmoil. It was Yang Jian (541-604) an official of the Northern Zhou kingdom who established the first re-unification of China - the Sui dynasty in 581. He reigned with the title Wendi Literary Emperor and started to rebuild a country torn by division. He used his strong Buddhist views to justify conquest on the basis of defending the Buddhist faith. He re-united the northern and southern halves of the country in 589 founding a new capital at Daxing 大兴 now named Xi'an. The civil service was enhanced by requiring tough examinations in law and Confucian philosophy so that appointments were again made on merit rather than patronage. Each province were ordered to put forward their students of outstanding talent to take the exams. 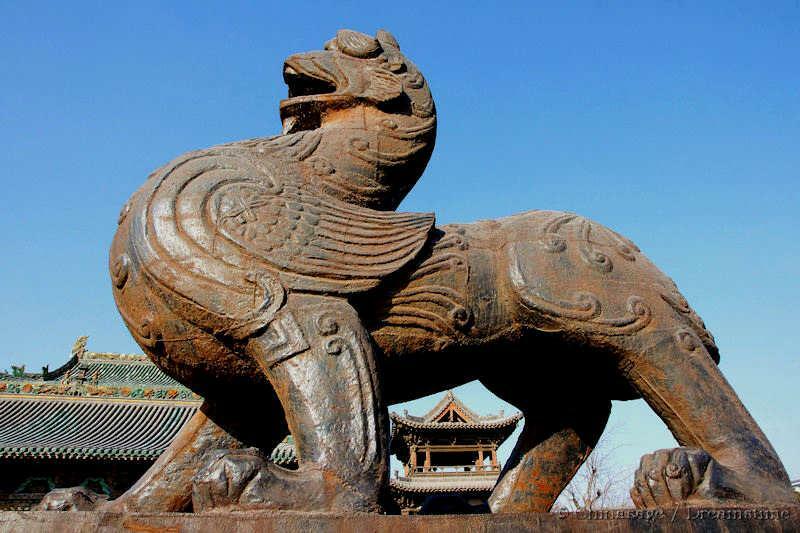 Administration was instituted under the ancient ‘Three Administrators’ model (secretariat; privy council and cabinet) and Six Ministries following the model of the Qin-Han period. 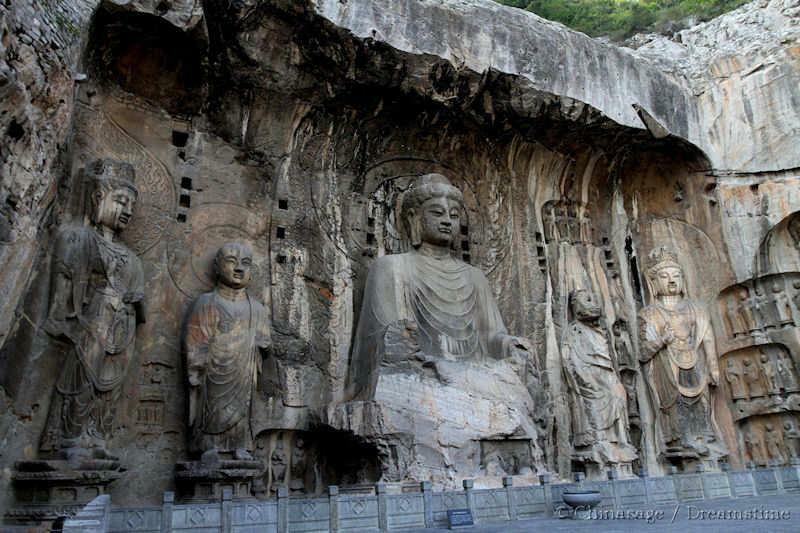 The ruling family were from the Xianbei ➚ tribe rather than Han Chinese although they soon took to Chinese culture. Many of the private armies that had fueled the incessant warfare between kingdoms were disbanded. Large construction projects were initiated such as the building of the Grand Canal. The canal enabled grain (mainly rice) from the southern provinces to be safely transported to the north in vast quantities. Another large engineering project was the strengthening of the Great Wall. Large state granaries were built and filled to give a reliable food supply for the burgeoning population. Wendi's successor Emperor Yangdi frittered away the goodwill towards his father with extremely expensive projects for his own pleasure such as the rebuilding of the city of Luoyang on an epic scale. It had a pleasure park of 60 sq miles [155 sq kms] bedecked with silk flowers in winter. Economic development from the printing of books and manufacture of porcelain made China a prosperous nation again. At this time China was by far the most powerful and populous Asian power with over 46 million people. Yangdi's expensive military campaigns to subjugate the Korean peninsula proved the downfall of the dynasty. Increased taxes were raised to pay for the Korean campaign and a disastrous Yellow River flood led to unrest and then to revolt. One of these rebel leaders went on to found the Tang dynasty in 618. 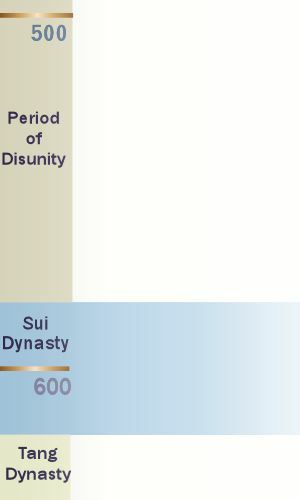 Strong historical parallels exist between the Qin and the Sui dynasties, both were short-lived and both instituted new unified systems under brutal rule. They were both followed by long periods of relative peace and prosperity: the Han and Tang respectively. Many Chinese feel this pattern has repeated itself with Mao Zedong's rebuilding of China followed by another period of peace and prosperity. Fig. 16--Sole of Chinese Woman's Foot. (after) A photograph by Dr. R. A. Jamieson. Dr. Jamieson says, The fashionable length for a Chinese lady's foot is between 3 1/2 and 4 inches, but comparatively few parents succeed in arresting growth so completely." Photo by William Henry Flower, available under a Creative Commons license ➚. The Chinese tradition of binding girls' feet lasted for a thousand years. It was a uniquely Chinese tradition. The foot binding was seen as a mark of a family's affluence because women with bound feet could not undertake any physical labor or work in the fields. The crippling of the feet forced women to walk in short steps and this was considered sexually attractive. They were called ‘lotus feet’. A daughter with bound feet was more likely to get married and this was another incentive for the cruel practice to be continued. Many western missionaries in the 19th and 20th centuries sought to bring the custom to an end. Perhaps the most famous example was documented by the English missionary Gladys Aylward ➚ in the book ‘The Inn of the Eight Happinesses’ which became a Hollywood epic film in 1959 as the ‘Inn of the Sixth Happiness’ ➚. In these days of strong anti-foreigner feeling these well-meant initiatives may actually have delayed its abandonment as foot-binding was perceived as part of distinctive Chinese culture under threat from foreign powers. The process of foot-binding started at a very young age (between the ages of 2 and 6) , when the bones are still supple. It was too late to start the process after the age of ten. The main bones were deliberately broken. The four smaller toes of each foot are gradually bent downwards and inwards. To achieve this, the feet are bound with wet cloths that shrink on drying compressing the foot. The binding cloths were kept on day and night during the whole time that the feet continued to grow. After gradual bending over a few years the big toe curved downwards and the four other toes are wrapped underneath forming a very high instep. It was considered that the shorter the length of foot the more attractive it was. Three Chinese inches was considered the ideal with the description 三寸金莲 San Cun Jin Lian ‘three-inch golden lotus’ although four or five inches was the most that could normally be achieved. Even as late as the 1950s it was said female beauty was 30% pretty face but 70% lily feet. Women walked slowly and painfully on the bent-over toes. It put them in danger in case of fires - they could not run away quickly. Some considered the inability to walk or easily run away a means by which men controlled their women, but the practice was carried out in the home by mothers on their own daughters. This is a pair of Chinese lady’s shoes for bound feet. They are very small as the ideal length for a bound foot was seven and a half centimeters. 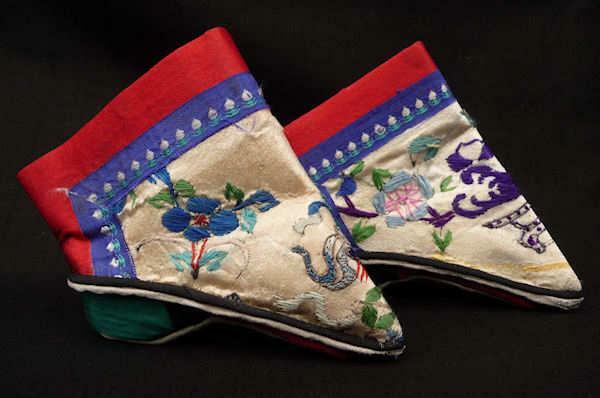 Shoes for bound feet were called foot-binding shoes and lotus slippers in many non-Chinese communities. They are referred to by a variety of names in China and Chinese literature. These include gongxie (arched shoes), xiuxie (embroidered slippers), jin lian (gilded lilies) and san cun jin lian (three inch golden lily/lotus). Object description: These are lotus shoes with a triangular sole. They are made of bright red and blue cotton and cream silk. Elaborate designs of dragons and flowers are embroidered on the silk. The blue panel at the top has white and green satin stitching along its length. The heel is covered in green fabric. History: Foot binding was a custom practiced in China and occurred during the Song Dynasty ( 960-1279 AD), over a thousand years ago. Small feet were greatly admired in China. To ensure that a young girl’s feet did not grow, her feet were usually bound after she was four years old. It was done with a stout bandage, the bandage being tightened daily after removal. The bound foot never ceased to cause pain while the woman walked. In 1911 this practice was banned by the Chinese government. Photo by Queensland Museum ➚, available under a Creative Commons license ➚. According to one story the custom began around 580CE in emulation of an Emperor 's favorite concubine. Another story is from the Song dynasty (around 965CE) of Emperor Liyu's infatuation with a dancer and another that it began with Xiao Baojuan ➚ (483-501). It grew very slowly as a badge of wealth and ambition, at first only within the leading families at the Imperial court. By 1000CE it had become widespread and for centuries thereafter about half of all girls had their feet bound. It became a badge of wealth and gentility as a successful marriage could turn around a family's fortunes. Only minority peoples and very poor families who needed girls to carry out physical labor did not do it. The tradition became so entrenched that when Qing Emperor Kangxi banned the practice in 1664 he had to admit defeat and revoke the ban four years later. One of the reforms brought in by the Taiping rebels was the prohibition of foot-binding. .
By 1902 intellectuals no longer inflicted it on their daughters and it became subject to an uneffective ban under the Republican government. Interestingly the custom was never allowed within the ruling Manchu elite. Some women then put themselves through the painful process of straightening the feet so they could walk normally again. In the 19th and 20th centuries foot-binding became the cause of much denigration of Chinese culture. In 1851 a ‘Chinese Lady’ with 2&half; inch feet was exhibited in London in what was more or less a freak show. Kang Youwei ➚ observed ‘Now China is narrow and crowded, has opium addicts and streets lined with beggars. Foreigners laugh at us for these things, and criticize us for being barbarians. There is nothing which makes us objects of ridicule so much as foot-binding.’ However, particularly in rural areas the practice lingered on into the mid 20th century, it was the Communist government that eventually eradicated it. The last known woman Han Qiaoni ➚ to have bound feet died as late as 2013 although it is possible that one or two remote rural villages in far flung provinces still cling to the custom. Citation information for this page : Chinasage, 'China re-unified under the Sui Dynasty 581 - 618', last updated 25 Nov 2016, Web, http://www.chinasage.info/dynastysui.htm.